Blink;Tech prides itself on supporting various green causes, both locally and world-wide. The threat of environmental degradation and climate change on the planet, while seemingly overwhelming, can be fought at the local level in even the smallest of ways. By the same token, the actions we take to help the overall environment can also help in building up our local community. That’s exactly what we’re doing today by shining a spotlight on a local beekeeper whose work is highly impactful, not only on the world stage, but right here in Sarasota. During Paul’s daily morning walk with his dog A.J., he noticed a bright yellow box attached to a tree in a neighbor’s yard. He came to find out that it was collecting a hive of bees that were found in the tree, so that they could be relocated to a safer place. 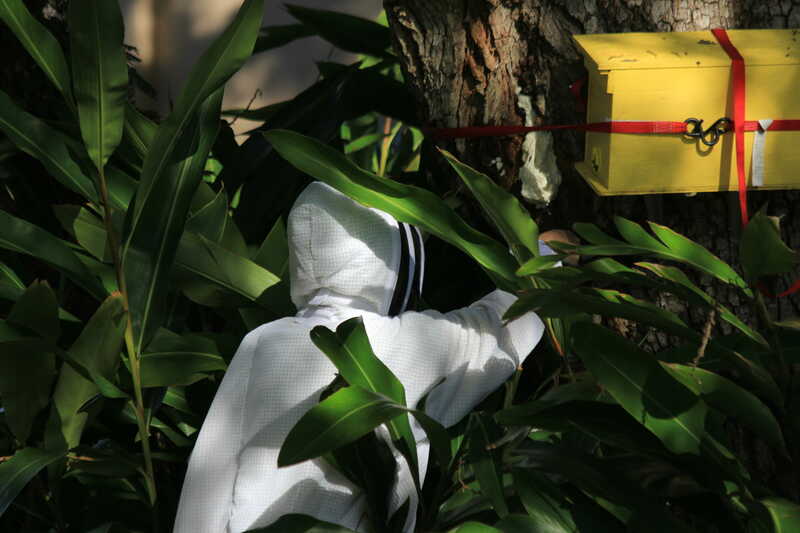 Once the hive was ready to be securely moved, Paul went back to the site to watch the beekeeper in action, and was at the ready with his camera. The beekeeper who showed up on the scene was Ashley Williams, a local mother and accountant who first took an interest in bees through her son’s scout group. The more she researched about bees and their effect on the environment, the more she felt a strong pull towards getting involved in bee advocacy. She started with reading books such as “Beekeeping for Dummies” and then invested in protective gear and equipment for her own hives. Eventually, she joined the local non-profit Suncoast Beekeepers Association, of which she is now treasurer. Looking back on her path, she is amazed that what began as a hobby has now turned into an enjoyable side hustle. Ashley also now finds herself involved in bee education, a topic which she feels is the most important issue faced by our community regarding bees. Many do not understand the importance of bees and their effect on the environment and our food supply. Often, when a hive is found near a home, the immediate impulse of the homeowner is to exterminate the bees in order to protect those living in the home. This can lead to insecticides being sprayed on the hive which usually leads to completely wiping out an entire colony. However, the best option is to have the hive relocated by a professional in order to save the colony, and preserve their positive, helpful impact on the environment. It is estimated that bees pollinate a third of the plants that grow our food, which means that without bees, we would lose a large percentage of our food supply. It is also important to note that the majority of bees found in the Sarasota region are not prone to attack, and are not the more aggressive Africanized bees so often reported on in the news. In regards to the community, Ashley often finds herself ‘paying it forward’ when asked to remove hives. While swarm removals are usually free, cut-outs and trap-outs can become costly based on the size of the colony. It’s important to remember that removal is not an easy task, and beekeepers need to be compensated for their work. However, for many just getting into beekeeping, gaining the experience can sometimes offset the high costs, and Ashley enjoys helping cultivate a circle of support among new and experienced beekeepers. As a member of the local community, as well as a human on this planet, there are many things we can do to help. First and foremost, become educated about bees and homeownership – know that there are better choices to be made when it comes to bees found near a home. Also, do not use pesticides on plants that attract bees for pollination. As bees collect the pollen and take it back to feed the hive, they also take whatever was put on the plants. This choice can inadvertently destroy an entire colony. It is also great to donate to charitable groups working to save the bees, and we can plant flowers and shrubs that attract pollinators to continue the circle of life for not only the bees, but for everyone on our planet. Suncoast Beekeepers Association also offers the opportunity to “Adopt-a-hive”, for those interested in going a little farther in their advocacy! If you would like to reach Ashley or the Suncoast Beekeepers Association, you can do so by visiting their website suncoastbeekeepers.org, or emailing Ashley via our contact form below. You can now follow Ashley on Instagram at @beesmakeLLC. As a member of the Sarasota community, Blink;Tech vows to do whatever it can to continue building up our community while protecting the environment as much as we possibly can. We hope that you join us and choose to save the bees, one hive at a time!